If you are looking for somewhere to board your mare during the breeding season look no further than Amarina Farm. Experience, professionalism, quality of care, communication, and success, are all part of the building blocks that have created Amarina’s reputation as one of the leading boutique farms in the Hunter Valley. The team at Amarina has a wealth of experience in every aspect of the breeding process. Led by owner/manager Craig Anderson, the staff provides specialised care ensuring your mare and foal are in the best hands possible. Amarina caters for permanent boarders, as well as seasonal mares whether they arrive to foal down, with the foal at foot, or as a dry mare. The farm works closely with Scone Equine Hospital to get the best results possible from your investment. The facilities at Amarina are first rate: safety and efficiency the key to a well-run operation. Located 10kms from Denman, the farm is local to all major studs in the Hunter Valley, and where 420 acres of fertile land has been purposely developed with horse husbandry in mind. All paddocks and yards have safe fencing, with the layout specifically planned so horses can be moved around the farm safely with ease. The farm has two crushes: one in the main vet area, and another in the foaling unit. Mares foal under lights with 24-hour supervision. Regular soil testing is conducted to ensure all horses are getting the necessary minerals and vitamins from the pasture. This is important for general wellbeing, development of young stock, and in-utero development of foals once the mare is pregnant. Attention to detail is a priority at Amarina. Foals are closely monitored as they grow and develop. Body condition and conformation are regularly assessed with nutrition, farrier work, and vet care tailored so each foal grows into the best version it can. Whether the foal is destined for the sale ring or the track, each is given every opportunity to grow correct, strong bones, setting them up for a successful future. 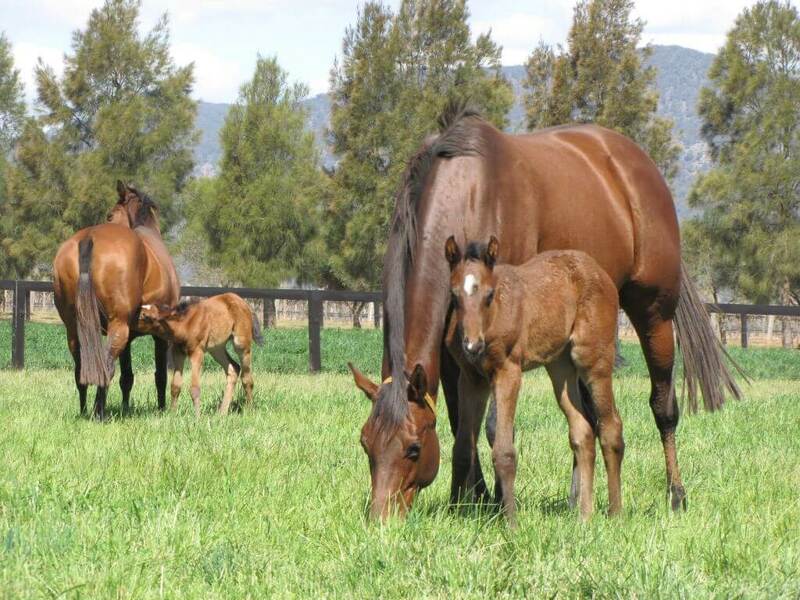 Foals returning home after the breeding season are sent with a full report and any follow up care needed. Client communication is important at Amarina; regular photo updates, emails, and phone calls ensure owners are kept up-to-date with how their horses are progressing. Farm visits are always welcome so owners can see their investment first hand. A great start in life sets a horse up for success in the future. The best advertisement a farm can have is results, and Amarina is consistently selling above sale average and producing winners on the track. Catkins, Sheidel, Super Cool, Artistry and Aeronautical are just some of the success stories born, raised and/or sold under the Amarina banner. Click on the Amarina Farm banner on the right, and enquire today how Amarina can provide the foundation for your mare and her progeny to give them every chance at success.